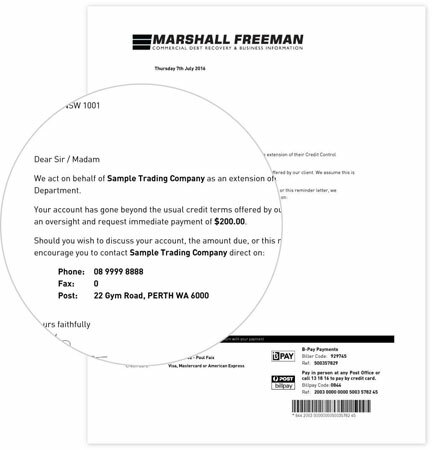 Marshall Freeman is Australia's leading debt collection agency, providing cost-effective and results driven debt recovery solutions for over 15 years. Leveraging the latest technology and recovery methods, we are a results driven company that makes your debt a priority so that you get paid faster. Our experienced collection team recognise each individual debt is unique, so they quickly identify a willingness and capacity to pay, then proceed with the best course of action to save you time and money. Being a specialist debt collection agency, we service all amounts of debt compared to other collection companies that only service certain debt amounts. We offer a hassle free and efficient collection process, whilst bringing the highest standards of customer service to make sure your debts are recovered with minimal costs to you. If you're looking for a personal debt collection company that gets results whilst at the same time maintains personal relationships, please get in touch as we are able to collect debts most other collection companies write off.